Our Lady & St Michael , Shipston-on- Stour was built in 1847 as the Anglican chapel of Shipston House, the Workhouse and Infirmary. The porch was added in 1858 to commemorate the marriage of Victoria, the Princess Royal (eldest daughter of Queen Victoria), to Frederick, the German Crown Prince, later Kaiser Frederick and father of Wilhelm II. The Grade II listed church is designed in the style of Augustus Welby Pugin’s early small churches, especially St Mary’s, Uttoxeter in Staffordshire. The building was rented for a few years and finally bought for use as a Catholic Church in 1978. 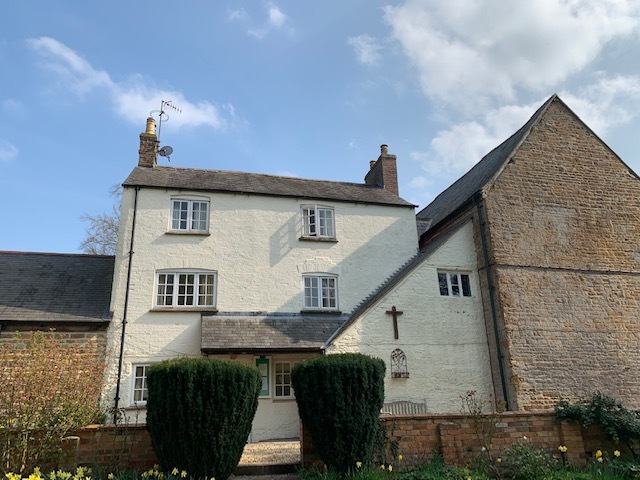 From the 1950s the parish priest of St Philip’s, Ilmington said Mass in Shipston in various places, including the Old Mill Hotel and the Scout Hut. St Philip’s was built in 1864 as a Catholic school which closed in 1931. It was converted into a church and opened by Archbishop Thomas Leighton Williams in 1935, consecrated by Bishop Philip Pargeter, Auxiliary Bishop of Birmingham, in May 1992 and closed in July 2013. St Philip’s replaced St Mary’s Chapel at Foxcote House, the home of the Canning family. Foxcote was a Mass centre for Catholics from Reformation times onwards. Mass was said in a room in the house until the chapel was built in 1814. It was closed when the Howard family sold Foxcote following Philip Canning Howard’s death in 1934. There is a carved oak memorial plaque to him and his wife Clare, made by Thompson of Kilburn (‘the mouse man’), in the organ gallery at Shipston. The church of Our Lady and St Michael was extensively renovated and restored in 1979-80 and a Parish Room added. The church was consecrated by the Right Rev. Terence Brain, Auxiliary Bishop of Birmingham, on 28 September 1992. The Parish Centre was built in 2010 and blessed on 29 September 2011 by the Most Rev. Bernard Longley, Archbishop of Birmingham. The metal sculpture on the outside of the Parish Centre of St Michael overcoming the dragon is by Judy Brown of Shipston. The east window, designed and made in 1980 by A. J. Naylor of Birmingham, represents the descent of the Holy Spirit in the forms of a dove and flames of fire upon Our Lady and the Apostles on the Day of Pentecost. The windows in the north aisle depicting the Annunciation were designed by Augustus Welby Pugin and made by John Hardman & Co. in 1850. They were commissioned by Viscount Campden for the chapel of Our Lady of the Annunciation at Campden House, Chipping Campden and were given to St Philip’s Church, Ilmington in 1934 and were transferred to Shipston in 2013. 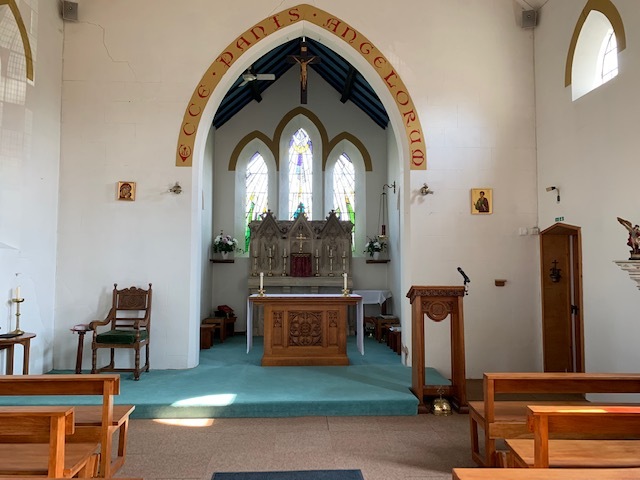 The altar came from the former convent of the Sisters of Charity of St Paul (‘the Selly Park sisters’) at Newbold Revel near Rugby. The carved stone reredos and the angel holy water stoup in the porch also came from Campden House and were designed in 1853 by Charles Hansom. They were moved to St Philip’s in 1934 and to Shipston in 2013. The font was designed by Henry J. Harper and made by Ormsby of Scarisbrick in 2008. On the adjacent wall is a small portion of tessellated pavement from the house of St John and St Paul in Rome, given by Bro. Lambert of the Passionist Order at St Saviour’s, Broadway. 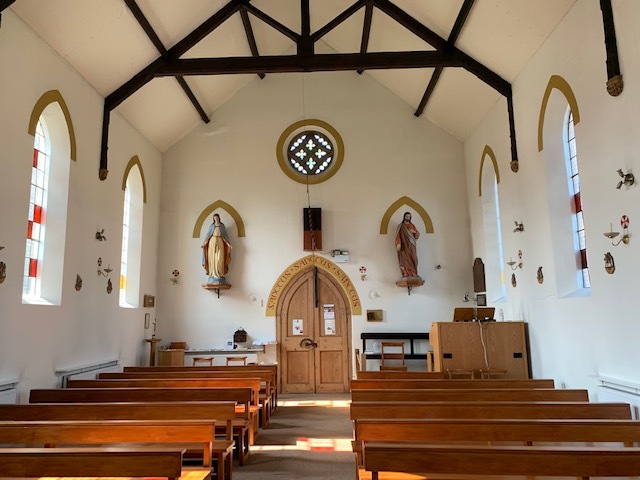 The statues of Our Lady Immaculate and the Sacred Heart, by Mayer of Munich, on the west wall came from the chapel at Foxcote and the icon of St Philip near the sanctuary is by Peter Murphy. The votive statue of Our Lady is of Spanish workmanship. The statue of St Michael was brought from Lourdes. There are carved heads on either side of the entrance door and carved corbels supporting the nave roof, including a ‘Green Man’ near the sacristy door. The church was redecorated in 2011 and the inscriptions above the chancel arch (Ecce Panis Angelorum – Behold the Bread of Angels), the aumbry (Olea Sacra – Holy Oils) and the west door (Sanctus, Sanctus, Sanctus – Holy, Holy, Holy) were painted by Peter Drinkwater of Shipston, a noted local character who was organist at Ilmington and Brailes for many years and who died in 2013.